BACKGROUND AND PURPOSE: One of the limitations of carotid artery angioplasty is the potential for embolic stroke. Our purpose was to assess whether the force of a self-expanding stent alone is usually sufficient to dilate severely stenotic atherosclerotic plaques without the deliberate use of an angioplasty balloon. If so, the procedural stroke risk might be reduced. METHODS: Over a 30-month period, 21 consecutive patients were prospectively identified with severe symptomatic carotid artery stenosis (>70% NASCET [North American Symptomatic Carotid Endarterectomy Trial]) and relative indications for endovascular treatment. All underwent treatment with the aim of deploying a self-expanding stent across the stenosis without the use of angioplasty balloons or distal protection devices. RESULTS: Stent deployment was successful in 20/21 patients. In one patient, the stent could not be deployed without balloon predilatation and a stroke occurred. In the other 20 patients, angiography before and immediately after stent deployment showed a reduction in the mean stenosis from 83% to 49%. A second periprocedural stroke occurred as a result of early stent thrombosis at 4 days in a patient who stopped Acetylsalicylic acid while undergoing bowel preparation for colon surgery. He made a good recovery. Average duration of follow-up imaging was 19 months (range, 1–44 months). During the follow-up period there were four deaths, all unrelated to the carotid disease, and no major strokes. At 5–11 months, the average residual stenosis was 21%, which remained stable in 16 of the 18 patients studied between 12 and 44 months (average, 24 months). At last follow-up, in these 16 the mean peak systolic velocity was 123 cm/s (range, 60–238 cm/s) and the mean internal-to-common carotid ratio was 1.8. The other two patients were long-term failures of the “stent-only” approach. In one patient, a heavily calcified plaque prevented stent expansion and the artery occluded at 18 months with a minor stroke. In the second patient, a recurrent stenosis developed at 16 months with one episode of transient ischemic attack. CONCLUSION: Deployment of a self-expanding stent alone resulted in a favorable and more gradual reduction of severe symptomatic carotid stenosis. Improvements in stent profile and chronic outward force may widen the indications for simple stent placement without the use of balloons or adjunctive protection devices. Carotid angioplasty with stent placement has emerged as a reasonable alternative to surgical endarterectomy for atherosclerotic stenosis at the carotid bifurcation (1–4). Outside of controlled trials, the procedure is usually reserved for patients with relative contraindications to surgery. This approach is warranted by the potential risk of procedure-related stroke with angioplasty and because of uncertainty regarding the long-term durability of angioplasty/stent placement compared with carotid endarterectomy. Embolic stroke following carotid angioplasty is based on the potential for cholesterol plaque dislodgement during guidewire passage and balloon inflation. This has been confirmed by the demonstration of cholesterol crystals in effluent blood during carotid angioplasty procedures (1,5). The problem has been addressed by the use of small-diameter balloons to predilate the stenosis before stent deployment and full angioplasty and by the use of distal protection devices to capture atheromatous debris in the effluent blood (6, 7). Although these maneuvers show promise in reducing stroke risk, they also involve the passage of a greater number of devices across the stenosis. The earlier experience of one of us (S.M.) 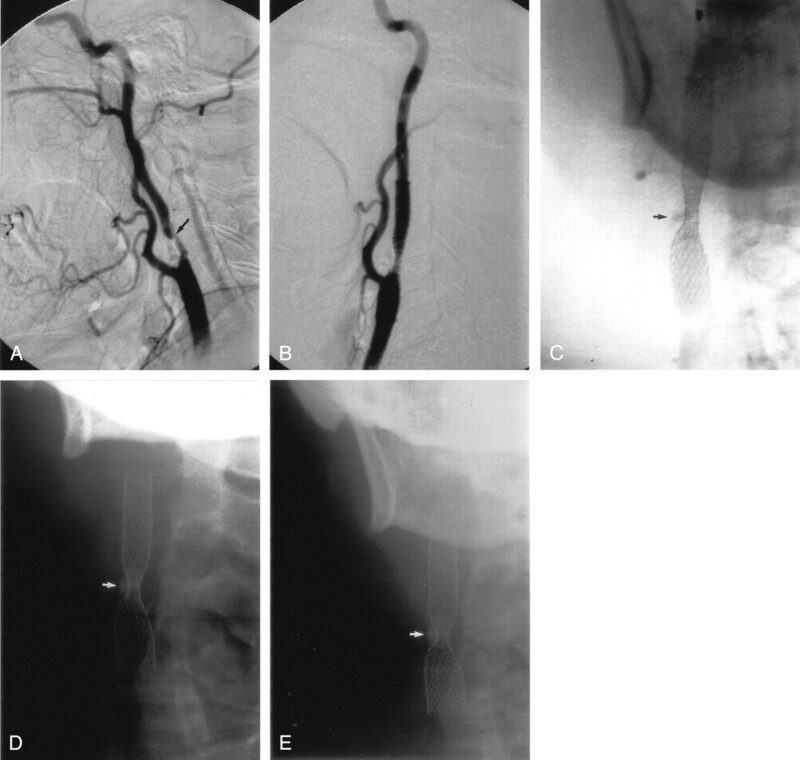 with the deployment of self-expanding stents into malignant biliary strictures demonstrated that stents progressively self-expand over several days after the procedure even when no balloon is used (8). It prompted us to question whether the same phenomenon would be observed after deployment of a self-expanding stent in atherosclerotic carotid artery stenosis. If so, the procedure might be simplified and potentially safer. Our first experience was the subject of an earlier case report (9). The present report summarizes our observations in a subsequent consecutive series of 21 patients over a 4-year period. Over a 30-month period, from March 2000 to September 2002, 21 consecutive patients underwent stent treatment for severe carotid artery stenosis. All had presented with transient ischemic attack or stroke referable to the appropriate vessel territory. There were 13 men and eight women, with a mean age of 70 years. Concurrent serious illnesses included myocardial infarction in one, chronic pulmonary disease in one, and colon carcinoma in one. Other factors included prior radical neck surgery with radiation in two, prior neck radiation alone in two, prior carotid endarterectomy in two, and contralateral carotid occlusion in five. Preprocedural carotid ultrasonography was performed in 16 patients. All showed high-grade stenosis with an average peak systolic velocity in the internal carotid artery (ICA) of 419 cm/s (range, 167–641 cm/s) and an average internal-to-common carotid (ICA/CCA) ratio of 7.2 (range, 3.6–13.8). 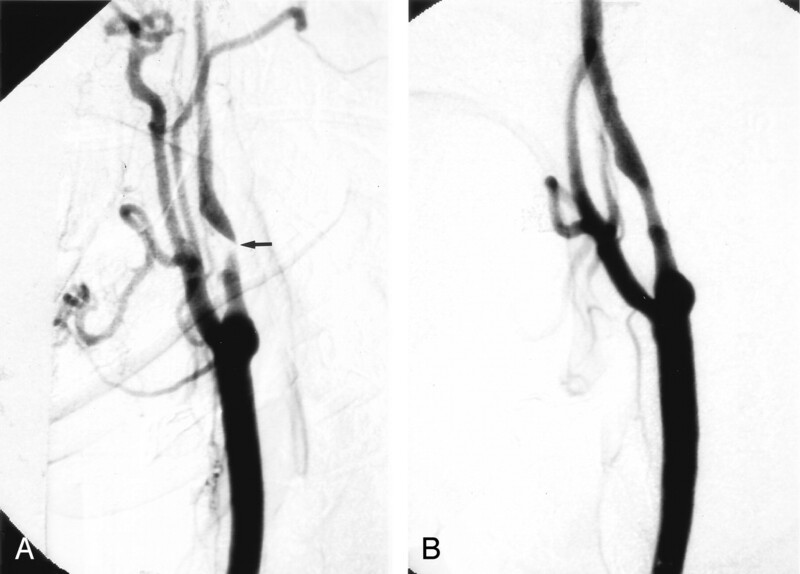 Diagnostic cerebral angiography showed severe carotid stenosis in all patients. The mean degree of stenosis was 83% (median, 83%; range, 67–99%). The size of the residual lumen (uncorrected for magnification) ranged from 0.1 to 1.0 mm, with an average of 0.7 mm. Before the procedure, a baseline diffusion-weighted (DW) image of the head was obtained. Patients were already taking antiplatelet medication, either acetylsalicylic acid or clopidogrel, and this was continued up to the time of the intervention. After obtaining informed consent, and under intravenous sedation, an 8- or 9F femoral artery sheath was placed. Systemic heparinization was instituted and monitored with periodic determination of the activated clotting time to maintain it at 2–3 times baseline level. The common carotid artery was cannulated with a 5F catheter, and a long 0.035-inch guidewire was used to exchange for an 8- or 9F guiding catheter. Under roadmap guidance, the stenosis was crossed with either a 0.035-inch or a 0.018-inch exchange length guidewire. The guidewire was advanced to the petrous segment of the ICA. The stenosis was then crossed with an 8-mm-diameter × 40-mm-length self-expanding stent, either a Wallstent (Boston Scientific, Natick, MA) in 5 cases, Smart stent (Cordis, Johnson and Johnson, Miami, FL) in 10 cases, or Precise stent (Cordis) in 6 cases. Following stent deployment, angiographic views of the neck and head were obtained. The heparinization was allowed to gradually wear off. DW image was performed within 24 hours of the procedure. ASA and clopidogrel were both administered for 1 month, after which the clopidogrel was discontinued. Follow-up assessment was done with periodic neck radiographs and Doppler sonography. These studies were carried out within 1 week of the procedure, then once or twice in the next 4 months, once again during the next 12 months, and annually thereafter. Clinical assessment was done at the time of radiologic follow-up. The degree of stenosis before and after the procedure was quantitated using the North American Symptomatic Carotid Endarterectomy Trial (NASCET) criteria (10). Conventional radiographs of the stent were assessed in both anteroposterior (AP) and lateral neck projections. The more severe degree of stent narrowing on either the AP or lateral image was used. The severity of residual stenosis impinging on the stent was measured by using the NASCET formula, on the assumption that the distal caliber of the stent represented the true diameter of the distal ICA. To assess the time course of the relief of stenosis by the stent placement alone, results from the 20/21 patients who had no balloon used either before or after stent placement were assessed. For each patient, paired results were tabulated for five different time intervals: immediately before and after stent placement, between the 1st day and anytime during the 1st week, between the 1st week and the 1st 1–4 months, between 1–4 months and 5–11 months, and between 1 and 2 years after the procedure. Paired results of immediate pre- and postprocedure angiography were available in all 21 patients. 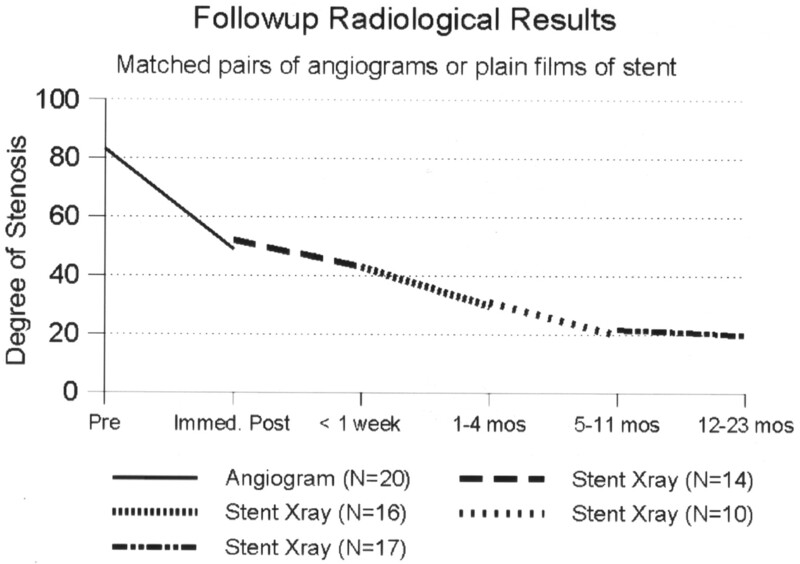 Paired results of stent radiographs were available in 14 patients during the 1st week following treatment, in 16 patients between the 1st week and 1–4 months following treatment, in 10 patients between 1–4 and 5–11 months, and in 11 patients between 1 and 2 years. Investigations using animal models and in human coronary arteries have observed stent incorporation into the vessel wall (11–13). Because conventional radiographs might give an incorrect impression of actual vessel caliber, we decided to rely primarily upon Doppler sonography results as indicative of progressive luminal dilatation rather than conventional radiographs of the stent alone. Paired results of ultrasonography (peak systolic velocity and ICA/CCA ratio) were available in 11 patients before stent placement and within 1 week after treatment, in 12 patients between 1 week and 1–4 months, in nine patients between 1–4 months and 5–11 months, and in 15 patients between 1 and 2 years after treatment. Statistical testing was performed using Student t distribution for paired samples. A two-tailed P < .05 was considered significant. In most cases (18/21) the guidewire and stent passage through the stenosis was straightforward and clinically uneventful. Three of the 21 cases presented technical difficulty, two of these due to the blunt tip profile of first-generation stents. In one case of near occlusion, the stent could not be advanced across the stenosis, but a lower-profile stent was successfully deployed. DW imaging showed no new infarction. The second case was another near occlusion. Again the stent could not cross the stenosis, resulting in an acute angiographic occlusion. After balloon predilatation was performed, the stent was successfully deployed. DW imaging showed bilateral inferior frontal infarctions, which resulted in temporary mutism. This patient was excluded from further follow-up because a balloon had been used. In the third case, a number of different guidewires were tried before one of them was successful in crossing the stenosis. DW imaging showed five small clinically silent infarcts all in the contralateral cerebral hemisphere and in the cerebellum, but none in the hemisphere supplied by the stented vessel. One patient had early stent thrombosis and right parietal infarction due to cessation of ASA combined with bowel preparation for surgery for colon carcinoma. The vessel subsequently recanalized with mild residual stenosis, and this patient was included in the follow-up cohort of 20 patients. During clinical follow-up, four patients died. The deaths occurred at 6, 17, 22, and 45 months follow-up, because of recurrent parotid carcinoma, acute on chronic renal failure, recurrent lung carcinoma, and acute myocardial infarction, respectively. The remaining 16 patients were followed for 8–42 months (mean, 21 months). There were no major strokes during the follow-up period. Twenty of 21 patients underwent diffusion-weighted MR imaging within 1–4 days of the procedure. Seven (35%) showed new abnormalities. In three, the changes were solely in the territory of the stented artery. Two of these were clinically manifest with stroke. The other was punctate in the precentral cortex and was clinically silent. In another three, the changes were outside the territory of the stented vessel and were clinically silent. The seventh patient showed small clinically silent changes in both hemispheres, three on the side of the stented artery and one in the contralateral hemisphere. Immediate poststent angiography showed a moderate improvement in the degree of stenosis in most patients. In some patients, the improvement was dramatic, with one stenosis decreasing from 99% to 29% (Fig 1). In most patients, however, the improvement was more gradual (Fig 2). On average, the angiographic stenosis improved from 83% to 49% immediately after stent placement (median, 48%; range, 29–73%). Two patients still had stenosis in the severe range (>70%); the worst of these was 73%. Both improved by 2–3 months to 18% and 20% residual stenosis, respectively. At last follow-up in all patients the mean residual stent stenosis was 19% (median, 16%; range, 0–54%). Comparing matched pairs of measurements in the same patients over several time intervals, the maximum stent expansion occurred during the procedure, followed by a gradual further expansion over the next 4–12 months (Fig 3). After the first year, the appearance remained stable out to 44 months. A, Right CCA digital subtraction arteriogram (DSA), lateral view, showing a very severe atherosclerotic stenosis of the proximal ICA, >95% by NASCET criteria (arrow). B, Repeat DSA, lateral view, immediately poststenting alone, without balloon angioplasty, showing a reduction in the degree of stenosis to approximately 29%. A, Left CCA DSA, AP view, showing a severe stenosis of the proximal ICA, measuring approximately 76% (arrow). B, Repeat DSA, AP view, immediately poststenting without balloon angioplasty, showing reduction of the stenosis to approximately 50% (arrow). C, Follow-up DSA, AP view, 3 years poststenting alone, shows no residual ICA stenosis. D, E, and F, Conventional AP radiographs of the neck immediately poststenting (D), 1 month (E) and 8 months (F) poststenting, showing progressive opening of the stent waist (arrow), with maximum expansion occurring in the 1st month postprocedure. Follow-up radiologic results based on initial angiography and subsequently conventional radiographs of the stented artery. Degree of stenosis measured according to NASCET method. Eleven patients had repeat sonography during the first week after treatment. The mean peak systolic velocity (PSV) fell from 461 cm/s to 275 cm/s and the average ICA/CCA ratio from 7.3 to 3.4. Subsequent follow-up was done in 20 patients, excluding the patient in whom balloon predilatation was required. Follow-up ranged from 1 to 44 months, with an average of 20 months (Figs 4 and 5). Mean PSV at last follow-up in all patients was 164 cm/s (median, 118 cm/s; range, 60–628 cm/s). Mean follow-up ICA/CCA ratio was 2.2 (median, 1.7; range, 0.8–7.9). All had velocities at or below 180 cm/s, except for three patients. One of these three had contralateral ICA occlusion, which would elevate velocities due to increased collateral flow, and this was confirmed by color Doppler, which showed that the degree of stenosis was mild. The second patient had a transient ischemic attack with recurrent severe stenosis at 16 months and continues to be followed. The third patient, by far the worst result in the series, had an unusually marked degree of plaque calcification. Her velocities and ratios remained high—628 cm/s and 7.9, respectively—out to 1 year of follow-up. The degree of plaque calcification prevented stent expansion (Fig 6). She remained free of further episodes of ischemia for 1.5 years, at which time her stenosis progressed to complete angiographic occlusion, with no new evidence of stroke on MR imaging. 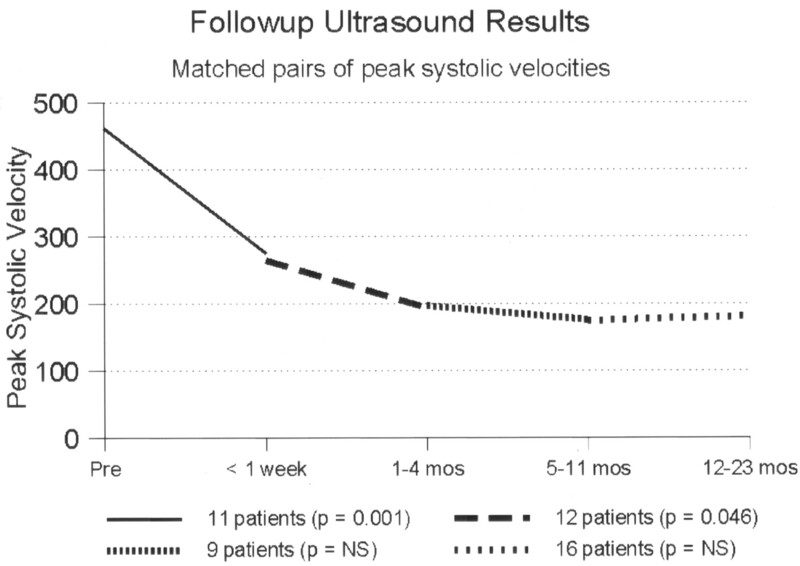 Follow-up sonography results based on peak systolic velocity measurements, Matched pairs of measurements in the same patients at different time intervals after stent placement. 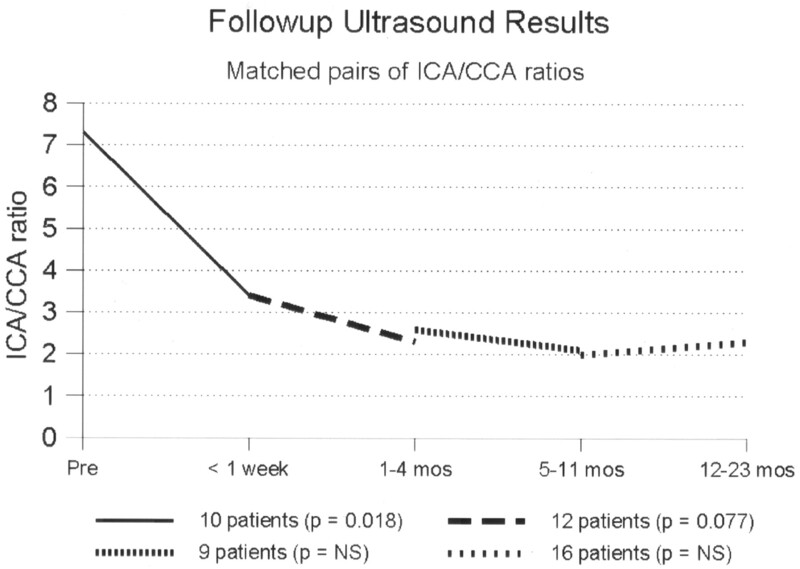 Follow-up sonography results based on ratio of ICA to common carotid velocity. Matched pairs of measurements in the same patients at different time intervals after stent placement. A, Right lateral CCA DSA, showing a severe stenosis of the proximal ICA, measuring approximately 80%. B, Repeat lateral DSA, poststenting alone, showing reduction of the stenosis to approximately 63%. C, D, and E, Conventional AP radiographs of the neck immediately poststenting (C), 5 months (D), and 8 months (E) poststenting. There has been no further expansion of the stent over 8 months. Note the prominent, focal plaque calcification (arrows). The mean degree of luminal expansion on the immediate postprocedure angiogram was 35% (median, 35%; range, 9–70%). Subsequently, between the first postprocedural radiograph and the final follow-up study, the mean luminal expansion was 31% (median, 33%; range, 7–53%). The effect of the stent on the atheromatous plaque could be categorized into four groups (Fig 7): (1) a striking immediate expansion much greater than any delayed response (five patients), (2) little immediate response but marked delayed expansion (two patients), (3) relatively equal immediate and delayed expansion which in combination resulted in a satisfactory dilatation (12 patients), and (4) neither an effective immediate nor a delayed response (one patient). The three patients in groups 2 and 4 showed only a minimal immediate response to stent placement (9%, 13%, and 18% luminal expansion, respectively). Of these, the two in group 2 had improved to 20% and 18% residual stent stenosis by 2 and 3 months, respectively. The third patient (group 4) with a severely calcified plaque had minimal delayed expansion and the stent was occluded at 18-month follow-up. Table showing breakdown of results according to the degree of immediate or delayed expansion of the self-expanding stent. Percentage results are according to the NASCET criteria, based on the widest luminal diameter of the metallic stent beyond point of maximum stenosis. The three types of stents used did not vary significantly in their ability to expand the carotid artery lumen, either in the immediate or long term. Average immediate luminal improvement was 32% (NASCET) when a Wallstent was used (n = 4 cases), 37% with the Smart stent (n = 10), and 33% with the Precise stent (n = 6). Average delayed expansion was 38% with the Wallstent, 25% with the Smart stent, and 29% with the Precise stent. Over the past 20 years, balloon angioplasty has emerged as an alternative to endarterectomy for the treatment of severe symptomatic carotid artery stenosis. The addition of stent placement to the procedure arose from experience in the coronary arteries, in which fewer untoward clinical events, increased vessel patency, less plaque recoil and dislodgement, and less restenosis were observed when balloons and stents were used in combination (14). The earliest stents were placed on the balloon and expanded by it. Currently, self-expanding stents are more popular, because of the lack of recoil or late deformation, the ease of deployment, and the ability to place the proximal end of the stent in the common carotid artery. The technical steps of the procedure, after guidewire navigation across the stenosis, typically include balloon predilatation of the stenosis, followed by stent deployment, and then balloon postdilatation (1, 6). Emboli are a major concern with carotid balloon angioplasty and slowed the introduction of angioplasty in the carotid circulation as compared with the peripheral and coronary circulations. Numerous studies have shown procedure-related strokes by using MR imaging with routine sequences and diffusion-weighted imaging (15–21). The incidence of new MR imaging infarcts ranges from 15% to 29% (15–21). Transcranial Doppler monitoring has been used to monitor emboli at different phases of carotid angioplasty (17,19,21). Embolic signals have been detected during balloon predilatation, stent deployment, and poststent balloon dilatation (17). One study found that the highest embolic loads occurred during balloon predilatation (19). This led to speculation that stent placement may protect against emboli by entrapment of embologenic plaque (19). Others have found that uncovered stents do not protect against debris release (5,17), or even found the highest embolic counts during stent deployment (7). It is believed that most emboli are produced by poststent dilatation, with the balloon squeezing the stent struts against the atheromatous material (5,6). An elegant cadaver study demonstrated that the largest and potentially most dangerous emboli were produced by balloon angioplasty alone (22). Because of the concern regarding dislodgement of emboli, distal protection devices have become standard in some protocols (5, 7). With transcranial Doppler monitoring, these devices have been shown to reduce the frequency of emboli during all three phases of the procedure (7). It was first observed by Men et al (8) in the treatment of malignant biliary strictures that self-expanding Wallstents continue to expand for 48 hours after the procedure. Delayed stent expansion has also been demonstrated in the coronary arteries for up to 9 months postprocedure (23,24). The addition of SMART (shape memory alloy) stent technology has also been associated with evidence of continued stent expansion over time (25). The possibility of eliminating poststent dilatation has been considered (25). Furthermore, the continued stent self-expansion might balance the potential for restenosis within the stent because of neointimal hyperplasia (25). Our question was whether carotid atherosclerotic plaques would show a similar response to that observed in the biliary tree (8). Our first experience indicated that stent self-expansion alone could successfully dilate a severe carotid artery stenosis (9). The present results demonstrate even more strongly that stent placement alone was satisfactory for most patients. Their stenoses showed a progressive dilatation, which was rapid initially and then slowly continued over the next 4 months and up to 1 year, remaining stable at long-term follow-up. Only two of 20 stenoses failed to dilate under the chronic outward force of the stent. In one patient, this was almost certainly due to the presence of an unusual degree of calcification in the plaque. Both patients showed progressive worsening of their residual stenosis during the 2nd year of follow-up. A concern with the “stent-only” approach has been the difficulty and potential risk associated with crossing the stenosis without balloon predilatation. We found that most degrees of stenosis permitted the passage of a guidewire and low-profile stent, without balloon predilatation. Stents vary in the profile of their leading edge, and in one case an earlier generation blunt-tipped stent abutted the stenosis and failed to pass through it, whereas the lower-profile stent tip traversed it more easily. 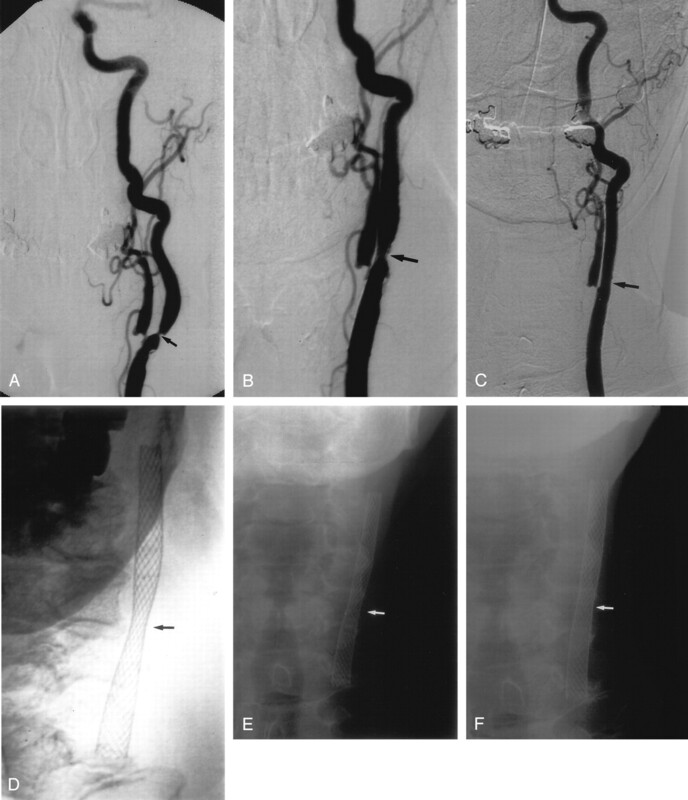 In another case, angiographic occlusion arose because of overly forceful attempts to traverse a nearly occluded vessel with a blunt-tipped stent. Balloon dilatation salvaged the situation, but temporary mutism occurred due to bilateral strokes in the posteroinferior frontal cortex. On the basis of our experience, we estimate predilatation to be necessary in small percentage of cases, particularly those with tight stenosis and circumferential plaque calcification. Antiplatelet medication is important and may be even more important when the stent has only partly expanded. This was demonstrated in one case in which the stenosis was reduced from 82% to 60%. In preparation for colon cancer surgery the ASA was discontinued, and at 4 days postprocedure the patient sustained a parietal stroke associated with thrombotic occlusion of the stent. Although there may be some variability in the chronic outward force exerted by the three types of stents used in this study, this was not apparent in the immediate or long-term results based on measurements made on conventional radiographs by using the NASCET criteria. It remains to be determined whether there is an optimal chronic outward force at which maximal stent self-expansion occurs in atherosclerotic carotid plaques. Stroke arising from carotid atherosclerotic disease is usually due to artery-to-artery embolus (26–28). Support for this notion is provided by the fact that stroke risk peaks at the 80th–90th percentile of stenosis and declines above 90% (10,29), that ulcers confer a significantly higher risk of stroke, and that asymptomatic carotid stenosis carries a much smaller risk of stroke (30). Therapeutic intervention should be primarily aimed at eliminating the potential for plaque emboli. Restoration of a perfectly normal carotid luminal diameter (0% stenosis) could be considered to be a secondary goal. In the carotid angioplasty literature, it is possible that there has been too much emphasis on achieving a perfect angiographic image of the carotid bifurcation, prompting the use of balloons to produce favorable imaging results. If stent placement alone resulted in favorable relief of stenosis and stroke prevention, the procedure would be technically less demanding than balloon angioplasty with distal protection. With Doppler studies showing emboli with each passage of guidewire, balloon, and stent (4,6), eliminating the balloon component might also be safer in terms of stroke risk. In the present study, most stents did not fully expand the vessel to zero stenosis. The vessel slowly expanded in diameter over time, by using minimal instrumentation and possibly with less initial arterial injury. There is good evidence that arterial injury with both balloons and stents leads to an inflammatory response and activates a proliferative repair process, the end result of which can lead to luminal narrowing and in-stent restenosis (31–35). Avoidance or limitation of the arterial injury associated with balloon inflation may be beneficial in minimizing such restenosis (24). The long-term results of this treatment strategy are unknown. Our results up to almost 4 years are generally favorable, although the consequences of converting symptomatic severe stenoses to asymptomatic mild to moderate stenoses are not known. Nor is it known what the long-term intimal response and restenosis rates will be with this technique. We need a reliable method to predict the vascular response to the stent and whether preliminary balloon dilatation will be necessary. Distal protection devices may not often be necessary, because they add further manipulation, expense, and risk to the procedure (36,37). They may only be required when preliminary balloon angioplasty is indicated. Balloons may not be necessary for many carotid stent placement procedures. Deployment of a self-expanding stent alone resulted in a favorable but more gradual reduction of severe symptomatic carotid stenosis in most of these patients. Improvements in stent profile and chronic outward force may widen the indications for this approach. We are grateful for the able assistance of Drs. D. Rosso, S. Naik, P. Rivera, and M. Kole, in the performance of the stent procedures. Mr. V. Khan provided data base assistance. Ms. J. Haston, Ms. C. Lockhart, and Ms. L. Boyd assisted with retrieval of data and manuscript preparation. Professor H. J. M. Barnett provided valued constructive criticism.